The first and only collection of pulp magazine illustrator Edd Cartier who contributed to a variety of Street and Smith magazines, including Astounding Science Fiction and Doc Savage. He also did work for Fantasy Press and Gnome Press in the late 1940s. A wonderful collection. 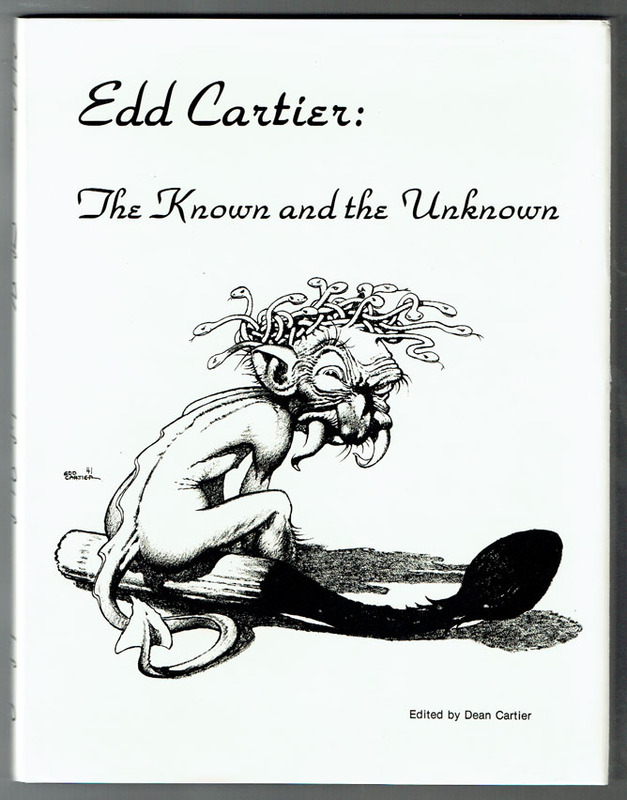 It has been nearly a quarter century since Edd Cartier abruptly ended his career as a fantasy and science fiction artist. But so enchanting and striking had much of his work been, the passing of the years has not dimmed his reputation. While Cartier indelibly etched his name in fantasy history with his drawings for Unknown and Unknown Worlds, his career as a pulp magazine illustrator had begun in the mid-1930s while still a student at Pratt Institute. When the North Jersey resident graduated from Pratt in 1936, he became a regular contributor to Street and Smith's popular magazine, The Shadow. But his work for that publication was dictated by the dark, somber style used by other artists who had done the interior illustrations. Not until 1939, when John W. Campbell Jr. launched Unknown, did Cartier have the opportunity to really allow his imagination to take over. The result was a series of outstanding fantasy drawings that enhanced the literary works of such writers as Eric Frank Russell, L. Ron Hubbard, L. Sprague de Camp, Fletcher Pratt, Jack Williamson, Theodore Sturgeon, Robert Bloch, Henry Kuttner, and others. Most of Cartier's professional work was done for a variety of Street and Smith magazines, including Astounding Science Fiction and Doc Savage. In the late 1940s he also did book work for Fantasy Press and Gnome Press. This is the first collection of his works to be published. It concentrates on three phases: his drawings for Unknown, those for Astounding, and the ten outstanding calendar drawings he did for Gnome Press in 1949 and 1950. While to many fantasy fans, Cartier is a name out of yesteryear, the fact remains he has become something of a legend in his own lifetime. This book, edited by his son, Dean, is but a small sampling of the man's unique talent.